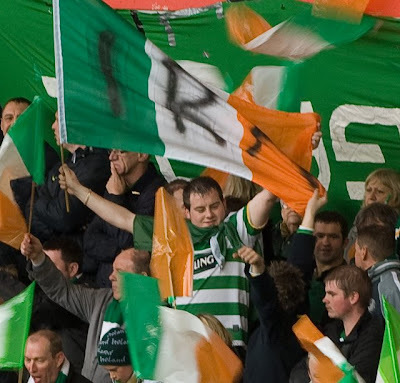 CELTIC last night vowed to hammer this sectarian yob who flaunted an IRA banner at Saturday’s Old Firm clash. The lout waved an Irish tricolour with the terrorist slogan scrawled across it in black marker pen. He was captured on camera grinning as he watched the game — which Rangers won 1-0 thanks to a Steven Davis goal — from Ibrox’s Broomloan Stand. Last night Parkhead chiefs vowed to deal with the ned.